We carry our guilt on our backs…the burden of this heavy load growing heavier and heavier as our transgressions accumulate on life’s journey. We’ve all messed up, made mistakes big & small, caused pain or what the “churchy” people call sinned, and we often use these mistakes as weapons to continue to perpetuate pain. We often fixate on what we did wrong, beat ourselves up, indulge in negative self-talk and damnation. We just feel too bad about ourselves… we wonder if we even deserve forgiveness! We feel isolated and alone, like we are surely the only one who has felt or behaved in this unacceptable way. We feel separate from the World, and worse separated from God who must be as disgusted with us as we are with ourselves. Many of us carry these heavy burdens of shame, guilt, and regret our entire lives & at times accepting blame for things that were not of our doing! When burdened by shame, guilt and regret we are tied down and bound up, unable to truly give, receive and share Love…from ourselves, from others or from God. We are often our own worst critic, locking our own prison doors. This is one of life’s biggest tragedies. We punish ourselves by withholding self-forgiveness, and I ask…How can this be helpful? How can this be productive? How can this bring us closer to Peace? How can this bring us closer to our Creator? We fill our time with rumination & regret. It sometimes lasts for hours, sometimes days, and at times for years before we decide we have punished ourselves “enough” and finally begin to consider forgiving ourselves and moving on. Sometimes we get stuck for good. Some people may feel they are suffering from a self-esteem problem…never feeling good enough for self-acceptance, feeling deep down that they somehow are less special or lovable than others. I challenge that it is a self-forgiveness problem! We berate ourselves for not living up to life’s impossible ideals, for not being good enough, smart enough, giving enough, patient enough…perfect enough! 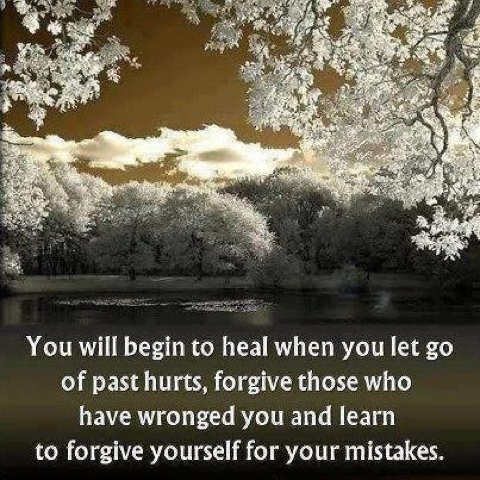 We ALL make mistakes, we all fall down…but the hope lies in picking ourselves up and beginning forgiveness’s journey! In order accept forgiveness from others we must first forgive ourselves, otherwise it is like being offered a precious gift and never opening it up. Until we embrace self-forgiveness we will be stuck with the inability to truly forgive or experience the blessing of being forgiven. Self-forgiveness begins with realizing we are worth being forgiven, because of our inherent good…the Spirit in us that God breathed into all of his children cannot be anything less than amazing. God is perfect and in us lies a Worthiness that God Knows and desires to return to Him. We must realize we are lovable, worthy of love and loved beyond measure! God Himself offers us Forgiveness through Grace with Christ Himself coming down to lead us Home! If God forgave us in such a profound way, how can we feel justified in withholding forgiveness from ourselves? We need to remember for now we are Earthbound and imperfect. Many times we think with the Earth mind and not with the Spirit of Love (God). When we choose doing things as led by our ego’s and to follow our Earthly desires we are going to mess up, feel pain and regret. That is just the way it is. We can try our best, and we should try to follow God’s path but withholding self-forgiveness will only lead us further and further astray. We fill our time with rumination & regret. It sometimes lasts for hours, sometimes days, and at times for years before we decide we have punished ourselves “enough” and finally begin to consider forgiving ourselves and moving on. Sometimes we get stuck for good. We punish ourselves by withholding self-forgiveness, and I ask… How can this be helpful? How can this be productive? How can this bring us closer to Peace? It does nothing but push us further away from happiness, from love… and from God’s perfect will for our lives. We are human and yet we are also children of God. By letting go of regret and shame we can embrace self-forgiveness! By embracing self-forgiveness we can then fully accept the forgiveness given to us, from others and from Christ! By opening the Gift of Forgiveness we can return to the Path God has laid out for us and let go of the heavy burden. Forgiving ourselves opens us up to be able to feel the lightness of Christ and to fully embrace Love like never before! QUESTION: Do you struggle with self-forgiveness or in accepting the forgiveness offered to you, from others or even from God Himself?